Kiernan Shipka, Joey King, and Kaitlyn Dever all show off their style at the Teen Vogue Young Hollywood Party with Emporio Armani on Friday (October 2) in Beverly Hills, Calif.
Also in attendance at the event were Halston Sage, Isabelle Fuhrman, William Moseley and girlfriend Kelsey Chow, twins Peyton and Spencer List, Girl Meets World stars Sabrina Carpenter (with sister Sarah) and Rowan Blanchard, Mom‘s Sadie Calvano, Black-ish‘s Yara Shahidi, and Interstellar‘s Mackenzie Foy. Teen Wolf‘s Max and Charlie Carver and Dylan Sprayberry (with sister Ellery) were at the party, as well as Scream‘s Connor Weil. FYI: Kiernan is wearing a Mary Katrantzou dress. Joey is wearing an Emporio Armani dress and bag, Jimmy Choo shoes, and an Ippolita ring. Kaitlyn is wearing a Gucci dress, Saint Laurent shoes, and Tiffany & Co. rings. Peyton is wearing an Armani sweater and pants and a Bulgari clutch and jewelry. Spencer is wearing an H&M Suit and shirt. Halston is wearing Pamela Love earrings. Sabrina is wearing Jennifer Meyer necklaces. William is wearing head-to-toe John Varvatos. Rowan is wearing Nicholas Kirkwood booties. 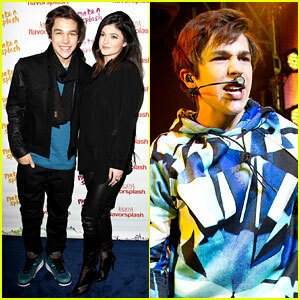 Austin Mahone Gets Support from Kylie Jenner at NYC Concert! Austin Mahone hits the red carpet with pal Kylie Jenner while attending the Aquafina FlavorSplash PepsiCo Super Bowl XLVIII Celebration on Wednesday evening (January 29) at Bryant Park in New York City. The 17-year-old singer performed on stage during the concert, as did Blake Michael. Austin will be kicking off Super Bowl weekend tomorrow (January 31) with a performance on Good Morning America, so make sure to wake up early to check it out! “Me and stas woke up at 4pm today.. Got massages… And started our day at like 7pm 😂😂 #LazyDays,” Kylie tweeted that afternoon. Jessica Szohr and Garrett Clayton step out for the Elizabeth Glaser Pediatric AIDS Foundation’s Annual “A Time For Heroes” Event held at Century Park on Sunday (June 2) in Los Angeles. 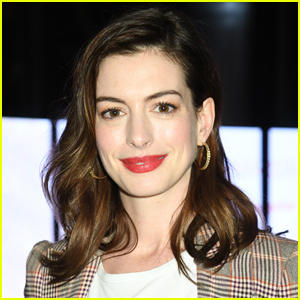 The duo was joined by Grey Damon, Joey King, Vanessa and Laura Marano, Blake Michael, Maia Mitchell, Grace Phipps, Aly and AJ Michalka, Nolan Gerard Funk, and Jessica Sanchez. Earlier in the month, Garrett attended Nylon’s Young Hollywood Issue Party held at the Hollywood Roosevelt Hotel in Hollywood. FYI: Garrett is wearing a Nalukai dog tag necklace. Blake Michael Photo Shoot - JustJared.com Exclusive! 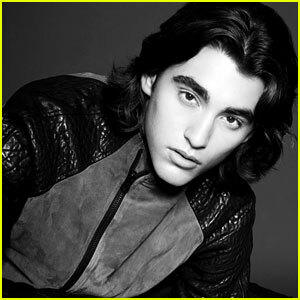 Blake Michael gets serious in this new photo shoot taken exclusively for JustJared.com! 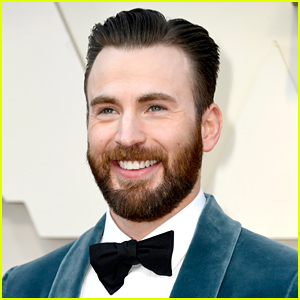 The 16-year-old actor got his start in the popular Disney channel film Lemonade Mouth before landing the lead role of Tyler on the series Dog with a Blog. The show follows Tyler and his step-sister Avery [G Hannelius] who don’t always get along, but share a secret from their parents – their adopted pet dog Stan actually has a blog and writes about all the family drama! 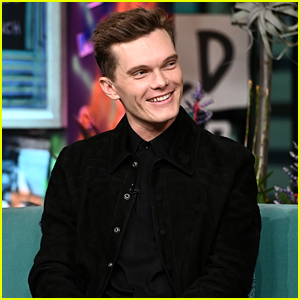 JJ sat down with Blake to talk about the show, his burgeoning music career, and of course, that hair.